Newport News Seafood Industrial Park is located off interstate 664 in Newport News Virginia. The harbor is sheltered and close to open waters. Described as one of the busiest small ports in the USA east coast, the area does an astonishing amount of business. 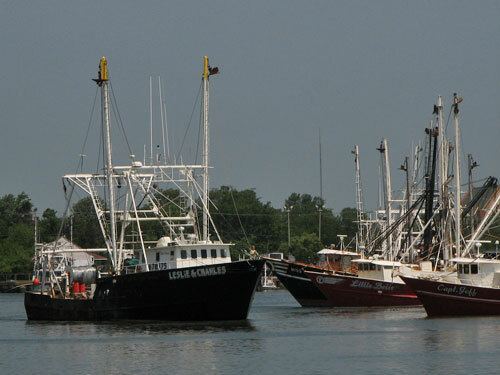 The harbor includes a mix of limited entry scallop boats, groundfish trawlers, crabbers, and other commercial fishing vessels. Several seafood packers and three ice houses support the fishing community there. Among them are Chesapeake Bay Packing, Inc., Old Point Packing Inc., Casey’s Seafood Inc. B&C Seafood Inc. and Peabody LLC. The port of Hampton Roads is consistently ranked among the top ports in the nation in total value of seafood, mostly due to the catches of scallops. The USA east coast scallop fishery shares the lead with the Northeast lobster fishery for the region’s most seafood valuable resource. The sea scallop fishery is the largest and most valuable wild scallop fishery in the world, and is often the most valuable single-species fishery in the United States. Recent landings have been worth about $400 million dock-side, with major landing ports at New Bedford, Mass., Cape May, N.J., and Hampton Roads, Va.